Love this ring. One of my favorites to wear! Deep, hypnotic blue is met with glorious, celestial white in this heavenly sapphire and diamond ring. With an exquisite design fit for royalty, this 10-karat white gold beauty is a splendorous work of decadent elegance and resplendent balance. All carat weights and measurements are approximate and may vary slightly from the listed dimensions. *T.W. (total weight) is approximate. 1/10 carat T.W. may be 0.08 to 0.12 carat. Treatment code E (sapphire) and N (diamond). See Gemstone Treatments for further information. My original wedding set has broken, so my husband is replacing the set. He purchase a beautiful sapphire and diamond princess cut engagement ring. The sapphires on that ring are rectangular and on the sides of the ring. When I seen this ring, I thought how perfect it will look as a wedding band. I have not been disappointed. True the diamonds are tiny but the sapphires are what I'm most interested in anyway. They are a beautiful deep blue (like sapphires are suppose to be). It sparkles and is eye catching. The quality is very nice for the price. A perfect match for me. This is my second purchase from Overstock.com and I am amazed at this ring. First it is set in 10K when most rings are now being set in sterling. It has weight to it and not a thin band even on the bottom. 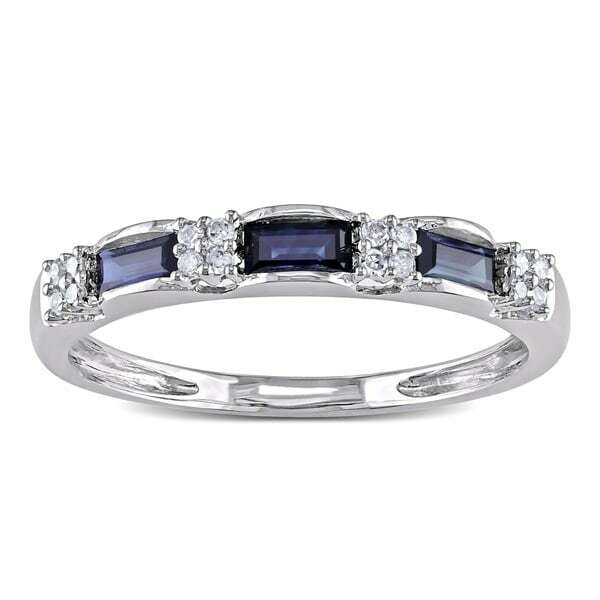 The sapphires are a lovely shade of blue, the diamonds actually show up and the ring as a whole is very attractive. I have been looking for a sapphire band style ring for a long time. I did purchase one that was in sterling and cost more than this one and returned it. I would recommend this to anyone who likes the band style and wants something classy but not over the top. This ring looks nice wearing it alone or stacked with other diamond bands. A great purchase, I am very happy with this. I debated over sending this ring back. I'm satisfied with it, but it's not as beautiful as it appears in the picture. The sapphires are a lot darker than in the picture, the diamonds are cloudy and the ring is extremely small and seems a bit tin like. I certainly wouldn't pay any more than I did, and the only reason I decided to keep it is to pair it with another ring so it doesn't look as small as it actually is. This is definately a "pinkie ring" and a small one at that. love the stones and the white gold forever. I love this ring! It is beautiful, top quality and comfortable to wear (nothing cutting in or anything). I wear it with my 18k white gold ring and it is a perfect match. If this is what you're looking for you won't be disappointed in the workmanship/quality. I am very happy and I've been looking for awhile -online and in the stores. Beautiful ring for price. It is thin and light weight but looks great when paired with my Sapphire wedding ring. Okay the ring is very nice...it is pretty true to the photo submitted above....very good quality for the money....and a good weight too...not cheaply lightweight. The stones of course are not large sapphires but they are very pretty and clear and the ring is just a very pretty petite ring.My only caveat is that we had my daughter's ring finger sized as a 7.5 and when the ring came while it was a size 7.5 it is slightly large and we must now have it sized to 7. so the sizes may run slightly large be aware when ordering.Other than that for the money the quality is right up there....very pleased. I've been looking for a white gold and sapphire ring to go with my anniversary diamond and sapphire. This matches perfectly and the price was excellent. Sapphires are dark, just how I like them and the scalloped profile adds character to what could have been a boring ring. Worn alone, the stones are low enough to not catch on anything. Very happy with my purchase! My husband and I just celebrated our 45th anniversary...which is the sapphire year. We wanted to get a memento of this special year for me to wear with my original engagement ring from 1965. It was difficult to find something that went with a ring from that decade, but we decided on this sapphire and diamond band. It looks stunning with my precious ring from so long ago. The sapphire stones are deeper blue than I had anticipated and the diamonds sparkle so pretty. I love the look, feel and heft of the ring. The band is narrow but has plenty of "WOW" power. I can wear the band alone and still enjoy a perfect look for this special year. Perfect wedding ban to my wedding set!! Its beautiful! And yes the Sapphires are dark like many reviews have said but its a blue Sapphire it is suppose to be especially because they are smaller. This is a small ring perfect for stacking but its beautiful on its own, too, just petite! I thinks its a wonderful price for how beautiful it is! I wanted a new wedding band that had my girls' birthstones....diamond and sapphire. I fell in love with this band when I saw it and love it even more in person. The band does get rather skinny in the back, but I'm glad it does because my engagement ring is unusual in that it gets wider as it goes around, so it's the perfect fit. I hope to wear it for years. I was looking for something to go with my wedding set. I didn't want just sapphires, so I thought this would be perfect. When I got it, I first started wearing it below my set and it was pretty, but there was something about the way they look together that wasn't quite right. One day I put it in the middle of my engagement ring and band...that was it! It was always beautiful, just had to find the right place for it!! I purchased this ring in 2010 as my wedding ring. It has perfectly complimented my engagement ring. The sapphires are much darker than they appear in the picture, but they match the sapphires in my engagement ring perfectly. I could not be happier with this purchase and will be buying the exact same ring again so I can stack with the original and engagement ring. it will be such a beautiful set! This ring is absolutely beautiful I am so glad I decided on this ring. I have actually had this ring for quite a while and it is still as beautiful as the day I got it. I have found it to be easy to clean, it does not discolor and is just beautiful and delicate. This is not a show stopping large kind of a ring but it is more of a gentle wear daily nice touch ring. I love it and am so gladness my husband chose it. pinky ring!! The color is rich, and sparkly! It is lightweight and a perfect petite band. The style is unique. Sapphires are a beautiful blue. I bought for my wife and she loves it. Dainty but very pretty.The stones are a rich blue. Im impressed with this ring. I love this ring. It is beautiful! Absolutely beautiful ring! Perfect for stacking or pairing with another ring. I love it in every way. I’ve been falling in love with sapphire over the last few months and wanted to add a little something to my collection. This was EXACTLY what I needed. "How long does shipping usually take? I didn’t have the option of choosing 3 day shipping or anything like that so I was just curious how long other people waited to receive theirs." Standard shipping is 5 to 10 business days. "Why does it look like the gold has been scooped out of the inside of the ring? Is the actual ring I would receive look like that?" Yes, it is scooped out as shown. Because the ring is quite small (smaller than I expected in all aspects...stones and width of the ring) the scoops on the inside of the ring are not very prevalent. The very back of the ring is not scooped out. Where it is scooped out is where the stones are behind. It is a beautiful ring and this was given to me by my husband as our 45th wedding anniversary. I am very pleased with it. I have a diamond and sapphire engagement ring and believe this ring will look great as a wedding band. The sapphires are emerald cut and it's set in white gold. Bands with stones: Ring sizing on many gemstone and diamond rings can also be altered, but the process depends on the style of the ring and the skill of the jeweler. Sometimes, a jeweler can resize a ring by two sizes but usually not more without resetting the stones. It is not recommended that a ring be adjusted by more than one or two full sizes. "are the sapphires in this ring natural or are they created sapphires?" These are real Sapphire stones. Three semi-channel-set baguette-cut sapphires each measure 2 mm wide x 4 mm long.